TÂ­he New York Organic Fertilizer Company (NYOFCO) plant, a subsidiary of Synagro, has successfully converted millions of tons of New York City sludge into fertilizer product. NYOFCO sought to specify and install a new odorant scrubber system for a particularly odorous area of their facility. Their goal was to remedy the odor concern, with a swiss replica watches Â­focus on reusing a secondhand mist scrubber. In addition, the facility was concerned about a City-mandated switch from natural gas to kerosene fuel during periods of high heating demand, and the effect this switch would have on emissions and permit compliance. Tech Environmental leveraged past experience and historical data to recommend recirculation rates for a variety of air pollutants (CO, THC, PM, NOx, NH3, and H2S) without accruing substantial budgetary costs. 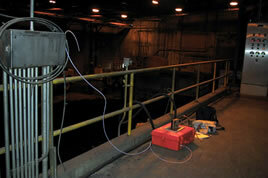 The project team then performed an extensive odor sampling study of the sludge storage and conveyance operations in order to discern the proper design parameters for the needed system. The sampling was performed using a combination of hand-held meters and collection via SUMMA canisters and Tedlar bags. The findings of the studies led to design parameters for a new scrubber. A three-stage scrubber design was developed in the existing single vessel, removing ammonia, H2S and organic compounds in unique stages. The design was implemented by Synagro's own construction services, so the project was ultimately a design/build effort by a team of Tech, Tighe & Bond and Synagro. The utilization of the secondhand scrubber and the completion of all work within the purview of the project team led to substantial savings for NYOFCO. When work was completed, the pre-construction emissions estimates were found to be representative. The NY Organic Fertilizer company required assistance with its air quality and odor control efforts in the form of sampling, modeling, and design assistance. Tech provided the necessary expertise to determine the facility's needs and the optimal design modifications to achieve them. Site Design by Graphic Image Group, Inc.